What are Transponder Keys, and Why Do I Need Them? Using transponder keys are an excellent way to secure your vehicle. They use radio waves rather than a conventional lock and key which make stealing cars virtually impossible. They were invented primarily as a way to prevent car theft, and are extremely efficient at accomplishing just that. The moment you lose your keys, or if you need a spare, you can’t call on any old locksmith. Instead, you must hire a licensed and insured locksmith who has the expertise of working with them. Keyway Lock & Security is a licensed locksmith company that specializes in transponder (computer-chip) keys. We are among the few locksmiths in Chicago that can program 98% of the transponder keys in the Chicagoland area and surrounding suburbs. However we do not make transponder keys for BMW, Mercedes, VW, Volvo & Saab. 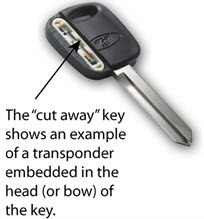 Transponder keys have embedded chips in each key enabling it to start your car, van or truck. Without this key, you have no chance of starting the vehicle. This amazing technology in automotive security has ensured that hot wiring, or stealing cars is nearly impossible. The only way a car can be stolen is if the thief steals the actual keys. Another great benefit of having transponder keys is that they can also be rendered “invalid” if stolen. If somebody walks-off with your keys or worse, your car, you can quickly have your locksmith or dealership cancel the keys. This will render the car impossible to start. Spare keys are created for transponder keys, but they also have to be programmed – or the key won’t work. Blank keys (as they are typically called) may be bought through many retail outlets, but it’s best to purchase them from licensed locksmiths or dealerships, because again, they have to be programmed in order to work. Most people will also use their dealerships to get an extra set, but the time it takes to make one, and the inflated cost they charge make buying transponder keys from dealerships a terrible option. Keyway Lock & Security are experts at cutting blank transponder keys and then pairing them with your car or truck. The secret to having a chip key that works is to use a licensed locksmith in your area. These keys are too complex and advanced for the “Do-it-Yourselfers” so unlicensed locksmiths are not recommended. If anything, they’ll cause damage to your car, than help you. One of the most common problems with these keys is when they break or become stuck in the ignition or door. A really good locksmith can quickly extract your damaged key, and provide you with a new programmed one that works. Best of all, your key will not be cloned. So in the event someone else should find your lost transponder key, it can not work on your vehicle. Because transponder keys are not cheap, you have to make certain that the next time you purchase a car, you have the right keys. Car dealerships can, obviously, program them but you will pay a hefty price. Going to a professional locksmith can save you money and a ton of time, versus working with a dealership, so keep that in mind when you need new set made.